Aerial photo showing part of the area logged so far from the 45-acre property in the 700 block of Beddis Road. 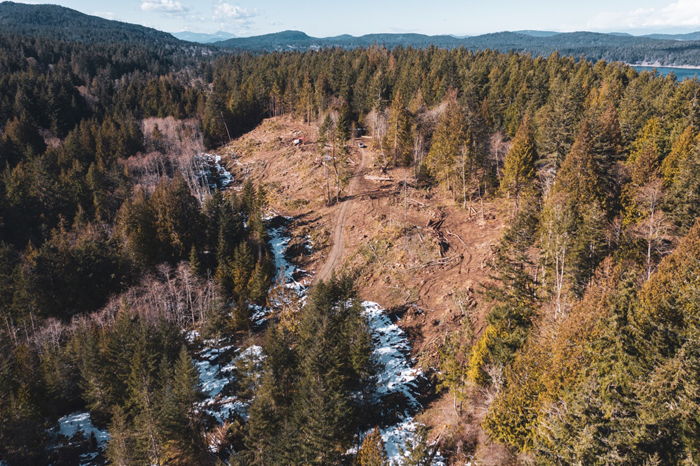 Islanders who are trying to stop large-scale clear-cut logging on Salt Spring are stepping up their game by making their appeal for action at the provincial level. A group of concerned neighbours and residents sent a letter this week to multiple provincial ministers asking for a temporary halt to logging on a 45-acre Beddis Road property and that government provide the Islands Trust with the tools and support it needs for forest ecosystem protection. Islanders are also coordinating a local branch of Forest March BC taking place in many communities this Saturday, April 6. The event calls for forestry reform and a more sustainable industry. Salt Spring’s march starts at the public library at 10 a.m. and progresses to Centennial Park after a few speakers and some music. Peter McAllister, one of the neighbours of the Beddis Road property, said not much activity has taken place at the site since the Dec. 20 windstorm, which redirected foresters to clean-up work. But he believes the issue is of pressing concern for the entire island. “Hundreds of parcels all over Salt Spring may be completely clear-cut from boundary to boundary while the Islands Trust takes no responsibility and our Local Trust Committee turns a blind eye,” McAllister said. The March 28 letter asking for provincial help was sent to Premier John Horgan and the ministers of Municipal Affairs and Housing; Environment and Climate Change Strategy; Forests, Lands, Natural Resource Operations and Rural Development; Agriculture and Health, as well as Saanich North and the Islands MLA Adam Olsen. A legal opinion provided to the Beddis neighbours by Allen/McMillan Law Corporation in January views that situation as a simple violation of Land Use Bylaw 355, based on the fact the property is zoned as agriculture and rural, not for forestry uses. “The Land Use Bylaw designates certain uses which are permissible in those zones, and states that no other uses are permissible. By contrast, ‘forestry uses related to the production and harvesting of timber’ are only permissible in parcels zoned for forestry,” a letter from the law practice states. The legal opinion was sent to the LTC in January and was raised at their Jan. 29 meeting by Jean Wilkinson during the town hall session. McAllister said they have still not received a formal reply. Speaking at that meeting, LTC chair Peter Luckham said the Trust has received different legal advice. He added the committee had received many pieces of correspondence about the issue and was sympathetic to residents’ concerns.